It’s rare that we get the chance to write a UK slot review for a game that’s as good as Cloud Quest. The software developer Play ‘n’ Go has come up with a real winner here, and there are many features that go above and beyond the usual mix of delights you’d expect from a slot game. 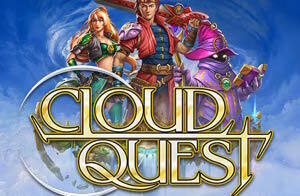 Cloud Quest is a 5 x 5 reel slot game that packs in 10 pay lines. Not too many, you’d think, but you’ll be delighted by the number of additional features in play. Along with a special Power Stone symbol, there is a wild symbol and a Super Power element to the game as well. You have to play all the lines in this game, which means your minimum bet per pay line is just one pence. 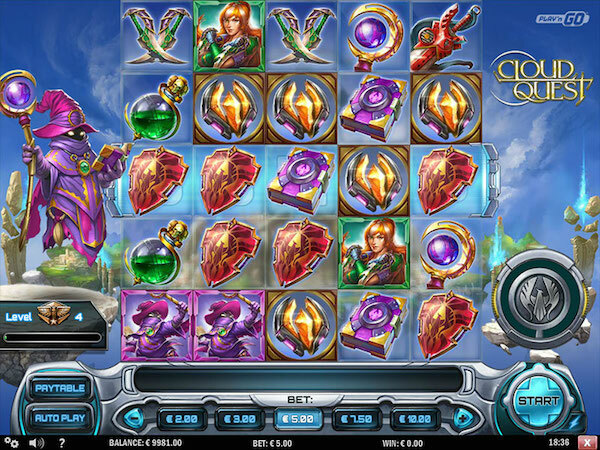 This popular UK slot game has a fantasy theme, and the characters in play are extremely detailed. This really focuses your attention, not to mention delivering some excitement via the special features. The symbols all drop into play from the top of the screen, rather than relying on the traditional reel-spinning appearance. It’s worth reading through the paytable prior to playing, as some symbols have special powers and features. The Super Power wheel adds in an extra bit of excitement; you’ll need to find Super Power symbols in order to activate parts of that wheel. Firstly, there is a wild (labelled as such to make it easy to spot). There are three superheroes worth various amounts depending on how many you get on a line. Other symbols include weapons and shields, and again, three or more on a payline will win you different amounts depending on the symbols you get. A wild can substitute for any other symbol. Additionally, any winning combination you get that doesn’t have any wilds in it will automatically transform the middle symbol into a wild. This means you could make up other wins without spinning the reels for another time. One great feature is that winning symbols forming a combination will drop off the screen in Cloud Quest. They are then replaced by more symbols, which could trigger another win for you. Watch the Super Power wheel on the right-hand side of the screen as well. When this is triggered, you can watch to see if the arrow lines up with whichever part of the wheel is lit up. If this happens, you’ll get a free spin and a random power. The idea is to fill the meter and get more powers as a result. The Super Powers are the Five of Fortune, the Emblem of Endurance, the Scatter of Success and the Mark of Multitude. These deliver a x5 multiplier, sticky wilds, scatter payouts and winning symbols turned into wilds respectively. The game also delivers a bonus round. You have to spell BONUS across a row in order to unlock this round. This begins with up to 20 free spins. The idea is to damage the monsters. Every time you succeed in doing this to a monster, you will get another three free spins. There are five monsters in all. 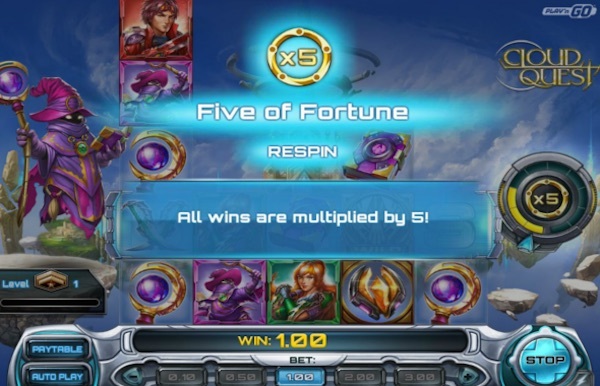 You get three free spins for each one you get past, and x100 your bet amount if you defeat the final one in the round. 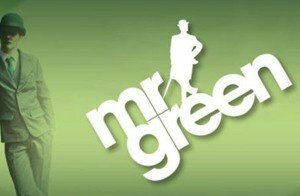 This game is great for most people to play, as it suits a wide range of betting options. With 10p the lowest bet to cover all the lines, you can enjoy multiple spins on a low budget. You can also increase the bet if you like. It would make sense to play in free play mode to begin with, so you can see how the special features work. There are plenty of them, after all. It’s quite easy to win several prizes in one spin, thanks to the ability to get new symbols dropping into place after every win. The RTP is encouraging too, at 96.52%. This game is very different from many other slots you may have played. Cloud Quest delivers some interesting and unusual features. In fact, once we’d played it for a while we forgot we were playing a slot at all! That’s not a criticism either – it is very appealing and the unique features such as the Super Power symbols make it a game you will want to play again and again. We think Play ‘n’ Go has come up with a definite winner here, especially as you can play it on a variety of devices. That means you don’t have to wait until you are sitting at your computer to enjoy it.